The six countries of the Greater Mekong Subregion (GMS) signed a Memorandum of Understanding on the “Early Harvest” Implementation of the Cross-Border Transport Facilitation Agreement (CBTA) in 2017 and 2018. The CBTA is a flagship initiative under the GMS Program to promote transport and trade facilitation. It was ratified in 2015. However, some parts of the CBTA are outdated and need to be revised. The GMS Transport Ministers, as members of the joint committee responsible for managing the CBTA, agreed in 2016 to launch the Early Harvest implementation of the CBTA in 2018, and to complete the revision process by 2019. 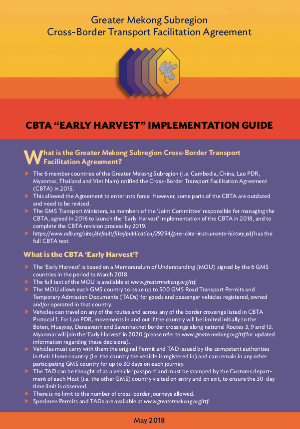 The CBTA Early Harvest is expected to operate from 1 August 2018 to 31 May 2019. Myanmar will join the Early Harvest and/or full implementation of the CBTA in 2020. Brochures in national languages will also be made available. These are provided for general information and may be subject to revision. Transport operators are responsible for complying with the allowable vehicle weights and dimensions for each country. Failure to observe the rules may result in the cancellation of permits and an operator’s exclusion from the CBTA. Training materials are available in English and in GMS national languages to supplement the information contained in the Early Harvest brochures. Transport operators are encouraged to look in detail at Modules 1a and 1b, which provide a general overview of the CBTA Early Harvest and important compliance issues in their home country (the county where the operator and its vehicles are registered) and the host county (the other GMS countries visited). Transport operators may also look at Module 5, which is about the controls performed by officials at the border.